Few small dogs are quite as precious as the Japanese Spitz. They are usually about or just over one foot tall and fifteen to twenty pounds and with their long, thick white fur and plumed tail curled over their back, they look like a tiny cloud cautiously sniffing at your feet. A Japanese Spitz’s temperament is usually sweet and mild. This easygoing temperament makes them perfect family dogs. They are also wonderful companions to both young children and older adults. They are first wary when meeting strangers, but once a Japanese Spitz is adopted into a loving home, it is a loyal and affectionate member of the family. The Japanese Spitz is also one of the longest-living dog breeds, as their lifespan is usually from about ten to sixteen years, making them an ideal pet for young children to grow up with. The beautiful white coat of the Japanese Spitz is relatively easy to keep clean, and they require regular grooming only once a week. However, this regular grooming is truly important due to their thick, double-layered coat, which can develop mats if not maintained properly. Their coat should be brushed once a week with a pin brush to prevent knots from forming. Certain owners also wash their dogs with whitening shampoo a few times each year to keep the brightness in their coats. However, they should not be bathed more than once every two months to prevent stripping the natural oils in their skin and coat. The Japanese Spitz’s coat also sheds slightly more often than other dog breeds, and due to its long fur, may require more frequent vacuuming. Their long coat may also poke through their paw pads, making their grip on indoor floors like linoleum or hardwood slippery and discomforting for the dog. Therefore, an owner may have to clip the fur between their paw pads. Grooming salons and mobile dog grooming services will also provide this service. On the bright side, the unique texture of the Japanese Spitz’s coat allows dirt and mud to be brushed from it easily, making regular baths not so important. Since it is a relatively active dog who loves the outdoors, the Japanese Spitz is a perfect breed for agility training modified for its smaller size. They are also incredibly intelligent dogs, so they are adaptable and interested in training and rewards. 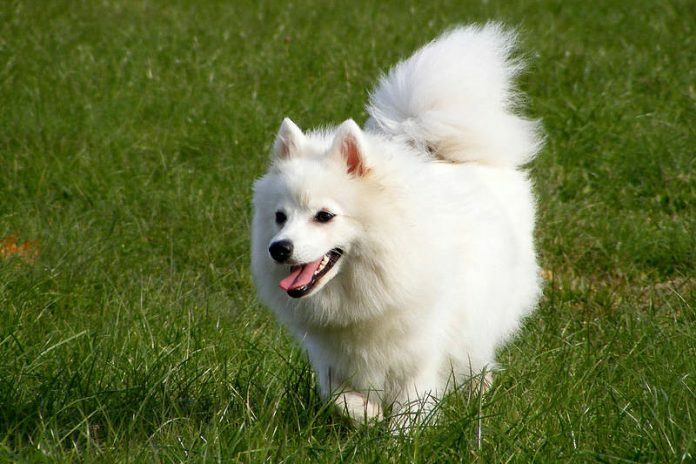 How fun would it be to watch the tiny cloud of a Japanese Spitz zoom after a tennis ball or catch a frisbee! The Japanese Spitz would do especially well in a home where the entire yard is fenced so they could go outside often to play with their family. Compared to more common breeds such as Golden Retrievers or Labradors, the Japanese Spitz looks quite wild due to their pointed snout and pricked ears. The Japanese Spitz itself is a relatively new breed. It was developed in the 1920s by Japanese breeders crossing other Spitz breeds. However, Spitz have physical features alike to those found in fossils of dogs from the stone age in Central Europe, which may mean this new breed can trace its line almost directly to the first dogs. Cousins of the Japanese Spitz where this ancient lineage is also visible include the Samoyed, Lapphunds, Chow Chows, and Eskimo Dogs. Like the Samoyed and their other cousins, the Japanese Spitz also has a black mouth and black foot pads, but the Japanese Spitz instead has a pink tongue compared with some of its cousins. The Japanese Spitz is also low-maintenance in terms of their health. They may develop patellar luxation, which is when the kneecap dislocates or moves out of position, which may be a hardship for such an active, high-energy dog, but should be able to be managed with the help of a qualified healthcare professional. They also may have runny eyes due to stress, allergies, or physical differences in their tear ducts. Naturally, always consult a qualified veterinarian if your dog is displaying any symptoms out of the ordinary. The Japanese Spitz would be the perfect addition to a large, active family, or the perfect companion for an older adult wanting companionship in a sweet, small dog. If you decide to welcome a Japanese Spitz into your home, look for a reputable breeder. Sourcing dogs from a reputable breeder or adopting through a breed-specific rescue will ensure their health or rescue a dog who would not otherwise have a home. This way, you can can look forward to many happy years to come with your new Japanese Spitz.